“Guess whos back, back again? Dean is back, tell a friend.” This episode was all about bringing back some old favorites. Not only do we have Dean officially back behind the wheel of his own body, but we also have a guest appearance of everyone’s favorite Sherriff plus a surprise guest from another world! That being said, not everything is rainbows and butterflies in ‘Bro town’; this episode is aptly named “The Scar” as it is all about Dean’s scars, both physical and mental. This episode opens with Michael nonchalantly experimenting on people by combining their blood with some Angel grace. All the experiments fail and the victims end up being burned out – smiting style. Apparently unconcerned about the big neon sign that a pile of bodies with their eyes burned out will bring, he leaves a major crime scene in Duluth, Minnesota that draws the attention of Team Free Will (that’s not suspicious at all). Sam, Mary, and Bobby go to investigate while Castiel is left behind to watch over Nick and Jack (because somebody has to). Castiel brings a distraught Nick (formerly Lucifer) some food and Nick can’t remember why he would let something like Lucifer possess him. 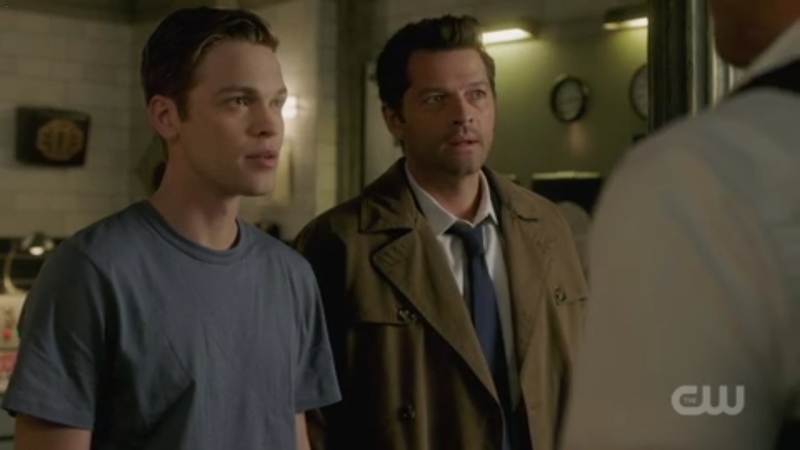 Trying to make him feel better, Castiel tells him that he was in a lot of pain after his family was murdered. This triggers Nick’s memories of that night and he breaks down in tears as everything that lead up to his possession comes cascading back (looks like my ‘Nick is still Lucifer’ theory may have been premature).